I would like some advice from people who own a 350z or 370z, or even better people who have owned both. I'm on the fence about whether to buy a 350 or 370. I currently own a 2003 350z with an automatic transmission. I got it before I learned how to drive stick and I love it but it's really beat up and I want something in better condition. Any and all input and advice is appreciated. Welcome- your question really depends on two things. First, do you own your current Z? Second, do you have enough in your bank account to purchase either a 350Z or 370Z? What kind of advice are you looking for exactly? It's up to your personal preference. Along with dkmura's questions; which car do you prefer the looks of; what are you going to use the car for? Do you know how to work on cars yourself, because most 350z's, even the later models may have maintenance issues that need to be addressed. If you can't do the work yourself, you could very well end up spending more on a 350z than an earlier year model 370z. You already have a 350z, so you are somewhat familiar with them. I would suggest test driving a 370z, to compare, and decide if it's worth the extra expense to you. 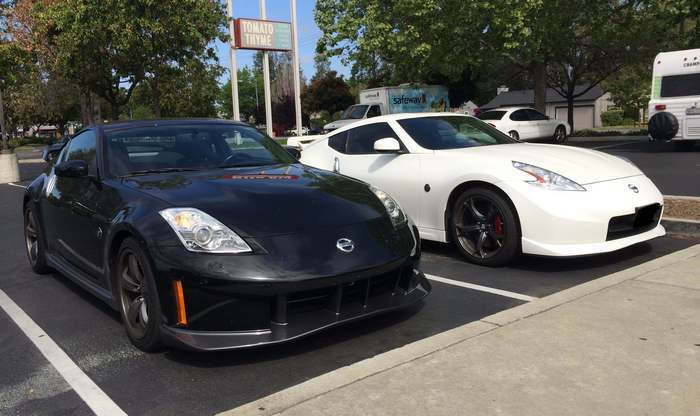 - Despite its appearance to the contrary, the 370Z is lighter than a 350Z. Couple that with a higher power engine (332 to the 306 of last HR equipped 350Z) and you have a car that is quicker and faster out of the box. - Z34 has a stiffer chassis due to its use of lighter but stiffer aluminum and composite sub-structures (both of which translate into stronger, lighter). - While there's significant aftermarket support for both the 33 and 34, it's much easier to find "cast off" parts (used) in the 370Z community than the 350Z. How do I know this? I shop the 370Z forum (for crossover parts) and am amazed at how many new postings there are for all sorts of parts as compared with either here or local sources. Everything from body parts to suspension to exhaust systems. Every day, new postings. - The fact that the 370Z is still in production means that parts and service availability remains high and... finding a good, low mileage one that has service records (KEY) is much easier to do than any car that's been out of production since model year 2009. That's 10 years.... in that time, so many cars just gone to waste, Dugan'd, or just plain exploited by idiots (ugh). That all said, however, I won't be getting rid of my "forever car" ('03 33) anytime soon - as in "never". But have (many times) entertained the notion of getting another 370Z Nismo (I gave mine away years ago). If you find a nicely maintained, low mileage, and clean example of a 33, don't rule it out. Price savings versus a comparable 34 leaves much room to tailor the car to you, if so desired. So in the end, as has been said, it's your call based on preferences and now, hopefully with some relevant datapoints. Two of mine (formerly). You'll note I no longer have either but still retain my first 33. Wasn't kidding when I called it my "forever car". I would think you can decide for yourself. It's your money. Either way, probably a toss up. Was a decision made? Gentlemen, this is the same person who created another user name and has asked several “Should I do this?” And “Should I buy a 350 or 370Z?” type questions since “abandoning” this username. And then, after people take the time to provide information, nothing. No response, no thank yous, nothing. But records show the person logged in several times following the troll questions. I am not a vindictive person nor a moderator who loses his cool easily when people misbehave here but when people display a clear lack of respect for others’ time and efforts, I say persona non grata. 350Z owners with CF lip, need you input. Long time Eibach owners....need your input.